We have 11 Guest Rooms at our gorgeous Windermere hotel. All rates include our quality home cooked breakfast and delicious tea & homemade cakes. You can choose from ‘Standard Comfy’ rooms which include a double bed (or king size if you prefer the ‘Large Standard / Small Premium Comfy’ room), shower, free wifi and enjoy complimentary tea and homemade cakes on every day of your stay. Or you could treat yourself further and rest your head on a super king size bed with Egyptian cotton sheets in a ‘Premium Comfy’ room. If you choose to book one of our ‘Super Comfy’ rooms you can also lie back and relax in a freestanding Victoria & Albert Freestanding Bath. If you want to enjoy our most luxurious accommodation, go for one of our ‘Ultimate Comfy Rooms.’ Room 2 overlooks the garden, enjoying a sunny aspect in the morning and offers a Tempur Mattress and freestanding V&A Rolltop Bath. Room 12 is a split level room with a feature spiral staircase that leads to the spacious bathroom where you can treat your feet on the heated slate tile floor. Go on to relax in the leather king size sleigh bed and enjoy a truly special stay here in Windermere. 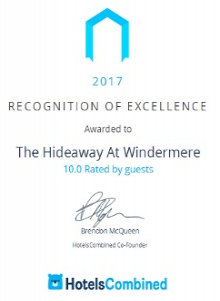 Call us now to stay in one of the most unique hotels in Windermere, and feel free to also explore our amazing Lake District break deals.